Do you want a more unique way of getting in and out of your home? Our custom step designs, made from natural stone or patio pavers, will set your home apart from the others on the block. The steps leading up to your home should be just as beautiful as your home itself, and a custom design will get the job done. 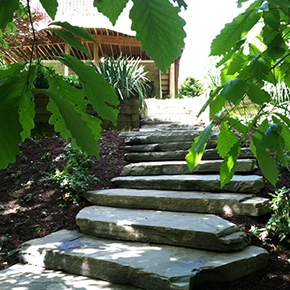 Steps are an important structural part of your yard, as they enable access to your home and bridge the gap between the ground and other structures. The professionals have years of experience designing and installing steps to seamlessly combine other elements of your yard. Trying to tackle steps as a do-it-yourself or amateur project is a recipe for disaster. We have the knowledge and skill to properly prepare the site to avoid any soil settling or damage over time. 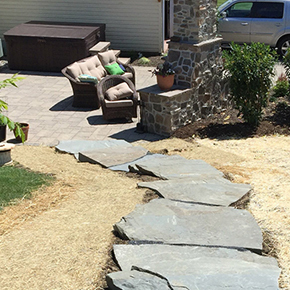 New steps made of natural stone or pavers are a gorgeous way to add extra beauty to your paver patio installation. Instead of dealing with concrete pouring, you’ll enjoy a quick and seamless installation that matches the rest of your hardscaping. The materials used to make your steps are available in countless colors, textures, and styles so that you can replicate the look of brick, cobblestone, or natural stone materials. Does your yard have a steep incline? 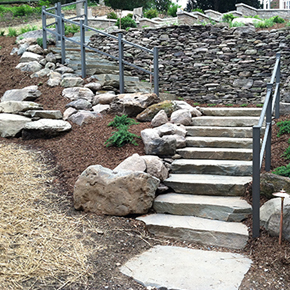 Steps can be integrated into your retaining wall design to combine function with beauty. Paving stones can form terraces that serve as steps and a transition from the lower portions of your yards to the rest of your outdoor living space.